ComplexCon is the world’s biggest streetwear and sneaker trade show. With the biggest brands in streetwear from Supreme to Adidas, this show reaches an extremely large segment of the sneaker enthusiast market. It was by extension, that Addidas’s partner, Footlocker would give a grand appearance. 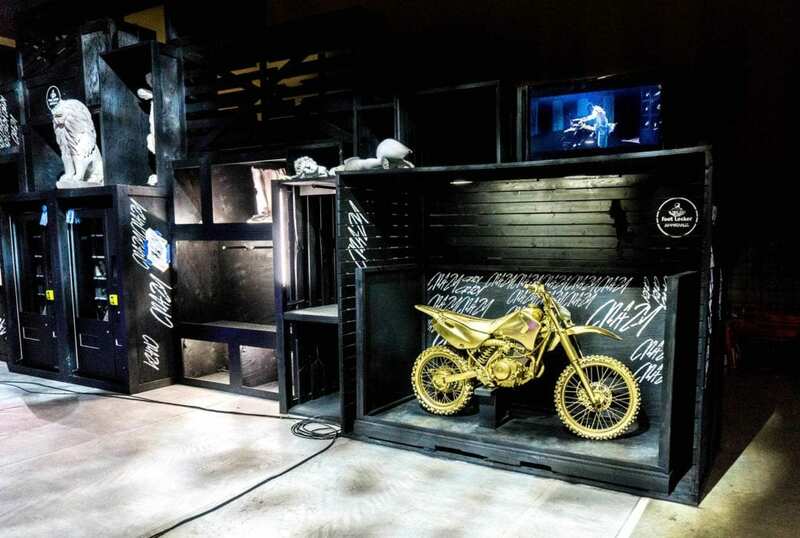 Following in suite of their partner, Footlocker followed a unique crate/warehouse aesthetic to highlight the sneaker “Drops” that were happening at the event. 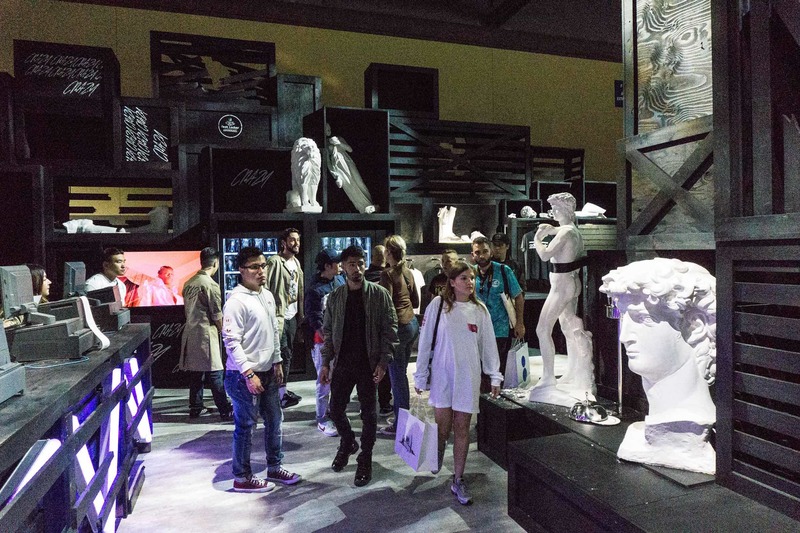 The trade show booth also acted as a statement and piece of art which made an observation about the sneaker enthusiast market. One word to embody this observation is “Crazy”, but we will get back to that later. Guest appearances were made by rap celebrities such as PlayBoi Carti and Pusha T. As well as other guest appearances by Instagram influencers such as Adrianne Ho. 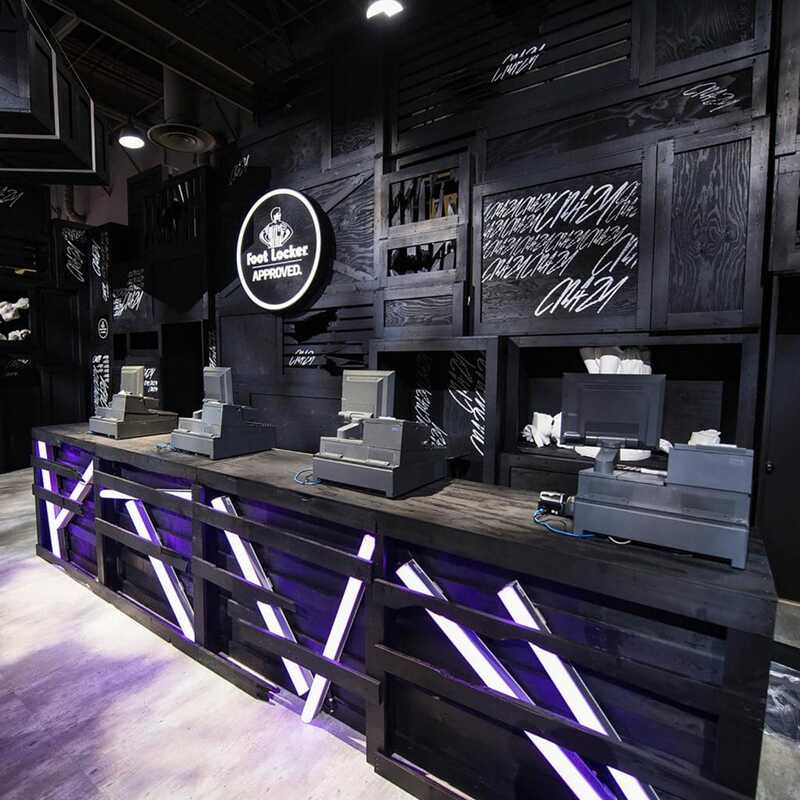 So what exactly was the theme that Footlocker was trying to go for with this booth design? Well, it boils down to two things, Urban and Underground. This is no surprise to anyone who has had experience in the streetwear industry. The roots of which lie in 90’s urban city fashion and rap culture. Most Tradeshow booths nowadays aim to look perfect, clean and sleek. This would be doing an injustice to streetwear cultural aesthetic which has a more gritty, rough and worn feel. So how did we match this unconventional theme while at the same time remaining to be a functional and aesthetically pleasing trade show booth? The first step to match the overall aesthetic was to pick a paint and finish that would reflect well on the brand and theme. The design of the booth was created by Stefan Beckman Studios and engineered here at Acme. We knew straight away, that a glossy finish would not blend well with the rest of the broken and tarnished pieces of the booth. This is why we decided to choose a satin black for its anti-glare and anti reflectiveness characteristics. Also, the black finish would go well with the urban and underground feel of the Booth. The next unique characteristic of the booth was the fact that it was completely made out of crates. To understand the rationale behind this, we must first take a quick dive into sneaker culture. Sneaker and streetwear culture is based on exclusivity and limited releases. This tight circle of small supply and insatiable demand creates a market where people wait for hours or even days to get their hands on a certain shoe. What better way to show of this need for expediency and rush, then to present the shoes in their most primal form. Out of a shipping crate. Its almost as if, the consumer is being transported to the warehouse where the shoes are held before they get to retail stores. This gives the onlooker the feeling of being behind the scenes and a step ahead of everyone else. To add to this, ComplexCon was home to a multitude of product releases that were only released at the Convention. Furthermore, to make the warehouse align more with street culture, many pieces of the booth were intentionally broken, with rubble littering the ground. As per the design created by Stefan Beckman studios we intentionally broke certain planks on the front of crates, as well as add a broken hockey mask statue to add to this effect. But, why does adding intentionally broken items align with streetwear and the theme that Footlocker is trying to go for? Once again, it has to do with rarity and exclusivity. The damage and tarnish on the booth is a physical embodiment of the insatiable demand for new and rarer sneakers. A lot of the pieces were intentionally broken in such a way, that it looks as if a crazed consumer came in with a crowbar looking for the crate which contained the latest drop. To put a linguistic affiliation to the theme would be crazy. But that is exactly it. 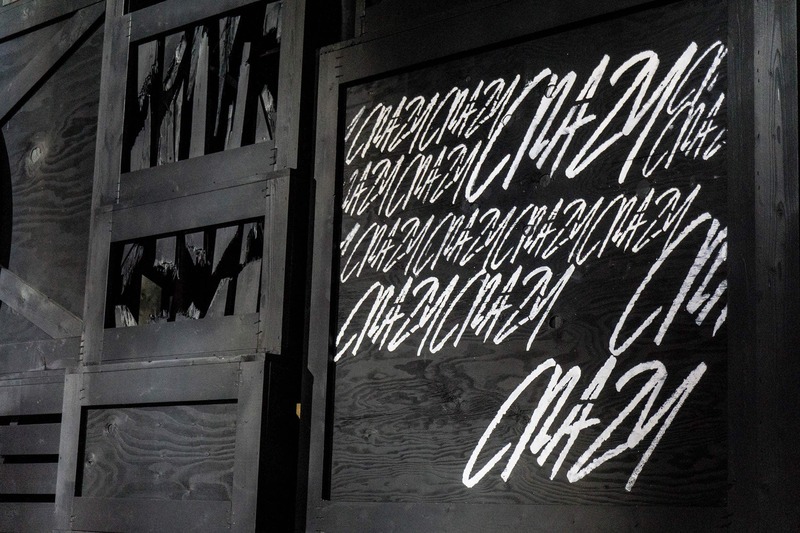 Footlocker branded the booth with the Word “Crazy”, which is a double entendre. For one, Adidas did sport their Crazy Low Explosive basketball shoes on the wall of the trade show booth, but Crazy also once again embodies the unyielding hunger consumers have for new streetwear. 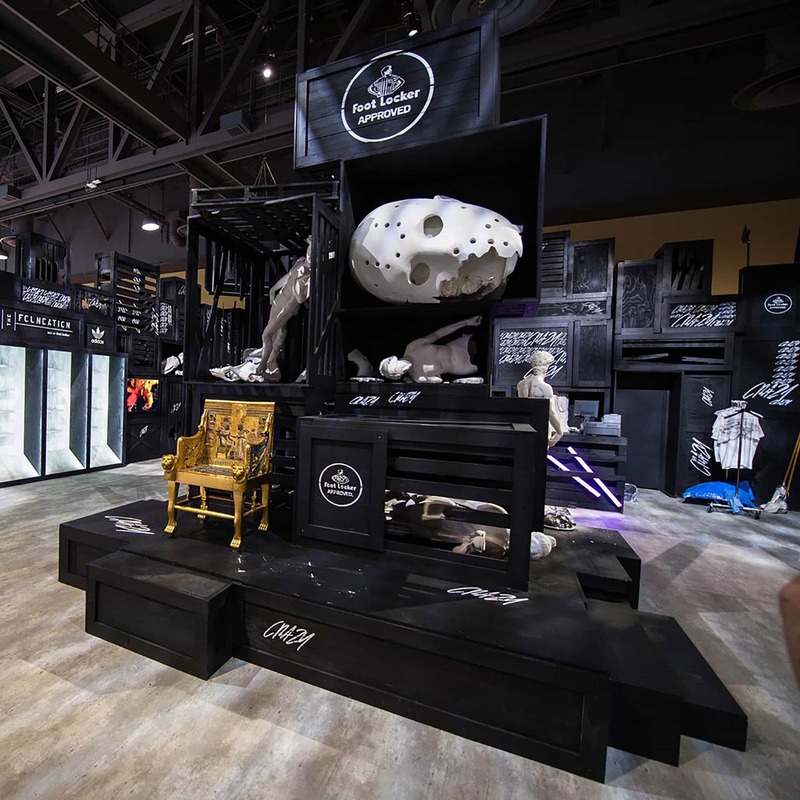 Not only did this tradeshow booth serve as a platform for brand recognition and sales, but it also acted as a piece of observational art by Footlocker. Not many Trade Show Booth’s do this, which is why we here at Acme are so proud to have engineered such an amazing trade show exhibit. We also would like to thank our genius friends at Stefan Beckman Studios, who provided the design for the entire booth. We would also like to thank our friends KampGrizzly for giving us the opportunity to work on such an amazing project and through there exquisite creative direction made this booth a reality. Without all three of these teams coming together, none of this would have been possible. Here at Acme, we strive to help your brand tell a story. Building to spec is only half the battle, the other half is building to the spirit of your idea. For this project, it was taking a wonderful idea provided by StefanBeckman studios and envisioned by KampGrizzly, and bringing it into the real world. Engineering and fabrication means not just choosing any old black, but choosing satin black on a knotty pine wood to give your booth the exact feeling and atmosphere that you pitched in your original slide decks. We are here to help and with huge conventions right around the corner such as CES, keep us in mind as your next trade show manufacturer! Or email us using our contact form here!